Bread is (unfortunately) one of my favourite things to eat. I have tried to stop eating bread for a few weeks so many times, but after some time I fall for it again and buy some to prepare a yummy sandwich for myself. When I walk by the Baluard bakery in Barceloneta it’s especially hard to temper my constant bread craving. You can already smell the fresh baked bread from around the corner. They really make bread how it’s supposed to be; rustic. I always buy the Pan de Payes, which is a typical Catalan bread. It’s round, with a crunchy crust and the structure of the bread has body. The taste is a bit acidic, which I love. Besides the pan de payes they make a lot of other kinds of bread, like from spelt flour or with cereals. 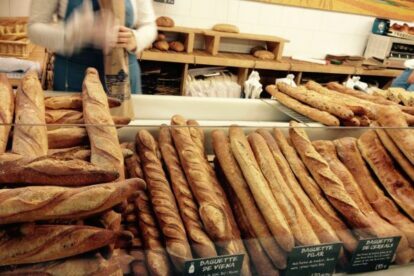 And because it’s always busy, most of the time when you buy your baguette it’s fresh out the oven, so you get it warm. Apart from bread they make pastries as well. And the croissants are almost as good as the ones from Hofmann. There is almost always a waiting line, so have patience while you’re waiting for your daily bread.